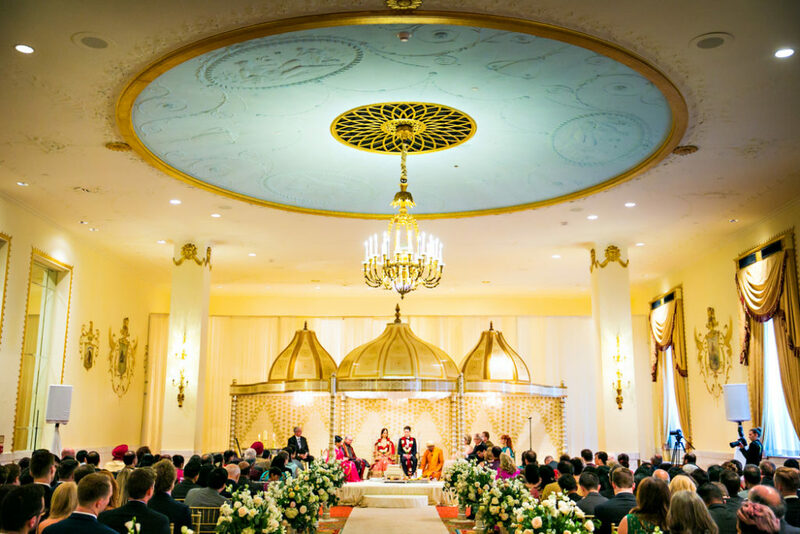 We have planned many South Asian weddings and Hindu wedding ceremonies for over 10 years in the Washington, DC area. 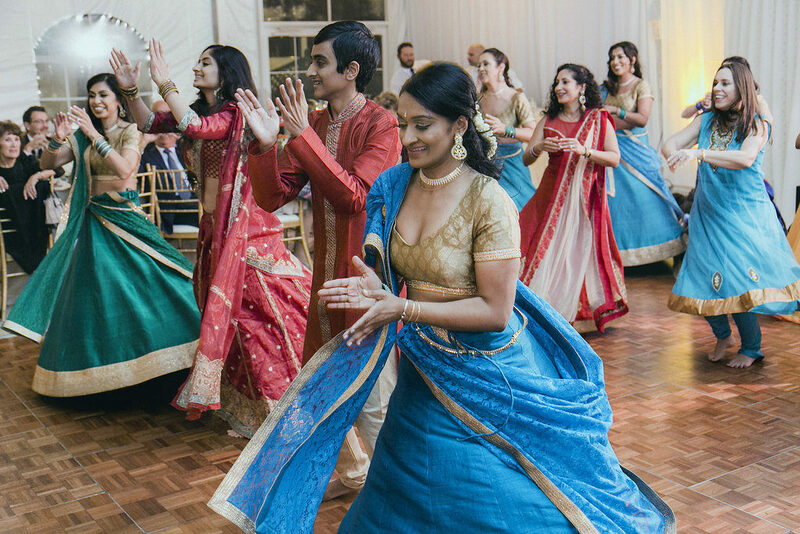 Indian weddings are lively, full of colors, rituals, dancing and music. 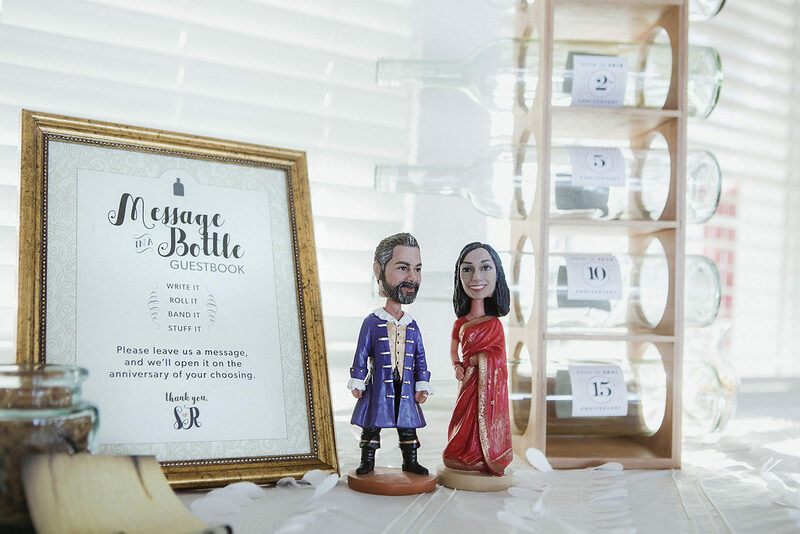 One of the perks of being a wedding planner is being exposed to different cultures and religions and to see how these are manifested through wedding rituals. If you have never attended an Indian wedding, here is a quick tutorial on what to expect. Note though that some rituals are performed with close family only in private prior to the ceremony. 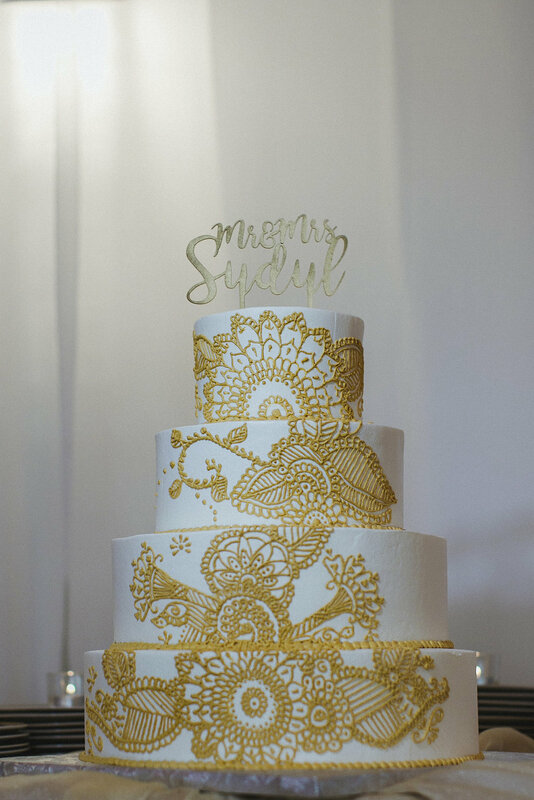 From the Indian weddings we have coordinated over the years, the festivities usually begin with the Sangeet (it could be a Garba if one is Gujarati) the night before which is characterized by lots of singing and dancing, and henna artists maybe present to draw henna for the guests. 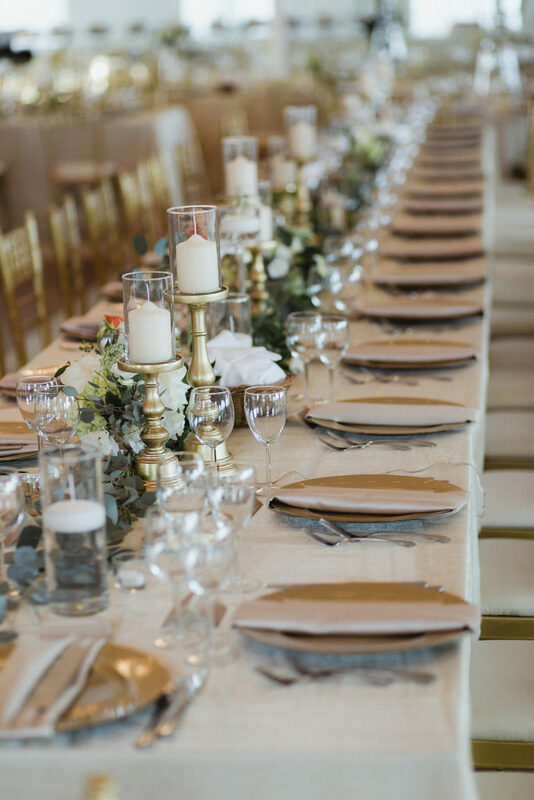 On wedding day, if you are invited to all the festivities, be prepared for a very long day. Sometimes the hosts will begin the day by providing breakfast. Following breakfast is usually the ceremony. After the ceremony, lunch may also be provided. You will notice there is a lot of eating! Guests and wedding parties then usually change into evening attire. Cocktails, dinner and dancing then follows into the wee hours. Hindu ceremonies tend to last around two hours as there are many rituals to the ceremonies. I have discovered that the length varies depending from which region in Indian the couple’s families originate. Different Hindu priests also contribute to the variation in length. Recently, I have noticed that couples are choosing to have shorter ceremonies, closer to one hour. Arrive early if you want to see or participate in the groom and his party (families and friends) arrive at the ceremony site. 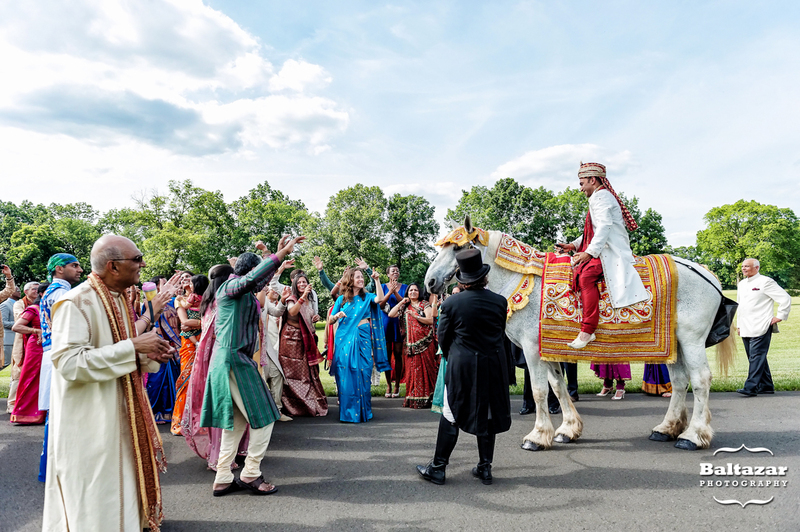 Called a Baraat, some grooms arrive on a horse or a fancy car while his party sing and dance. The bride’s parents, family and friends greet them. Guests who are Indian will likely be wearing their traditional attire. It is perfectly acceptable to wear formal attire as you would to any wedding. Feel free to wear something colorful. 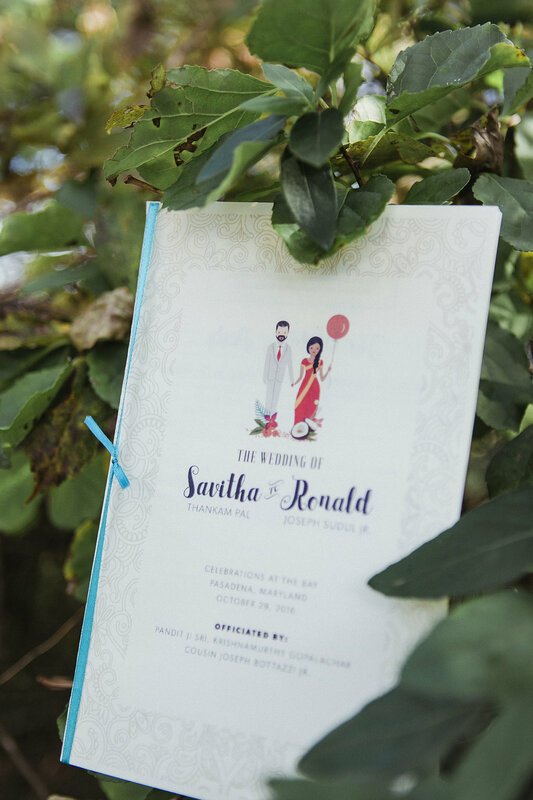 Whereas Christian ceremonies tend to focus more on the couple, most Asian cultures focus on the joining of two families and Indian/Hindu weddings are no exception. You will see that both sets of parents are more involved during the ceremony than in Christian ceremonies. 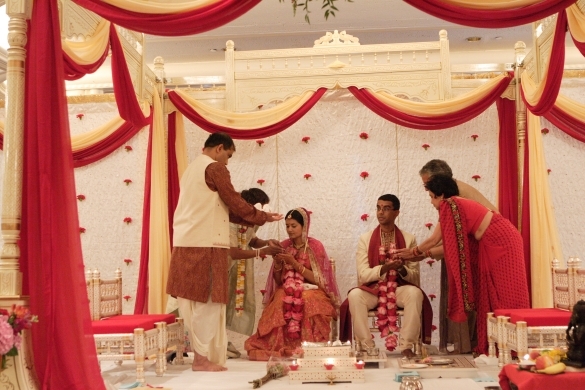 The wedding ceremony takes place under a mandap, similar to a chuppah in Jewish ceremonies. Ganesh Pooja/Puja: The ceremony begins with an invocation to Lord Ganesh, or Ganesha, the elephant-headed Hindu god to seek his blessing. Jaimala/Jaymala: The bride and groom welcome each other by exchanging garlands. Punyah Vachanam: Prayers are offered to God seeking purification of the mind and body. Kanyadan: Giving away of the bride. The bride is often led to the mandap by a brother or uncle, where the groom waits with the bride’s parents. The bride’s parents offer their daughter in marriage in a ritual called Kanyadan. Ganthbandhan: Tying of the knot. Tying the ends of the bride and groom’s clothing together symbolizing their union, happiness, fertility, prosperity and longevity. Mangalsutra and Sindoor/Sindur: The groom give the bride a sacred gold necklace with black beads. As someone once explained this me, this is the Indian version of a wedding ring. The groom applies sindoor/sindur in the parting of the bride’s hair signifying that as his wife, her protection is his responsibility. Mangal Fera/Havan/Homam/Homa: The couple walks around the fire 4 times, offering puffed rice to the fire, representing the four aspects of life: moral values and religion, wealth, enjoyment of life, and oneness with God. The brides family may pour rice into the bride’s hands, half of which slips into the groom’s hand. Seven Steps/Saptapadi: The bride and groom take 7 vows and steps together. 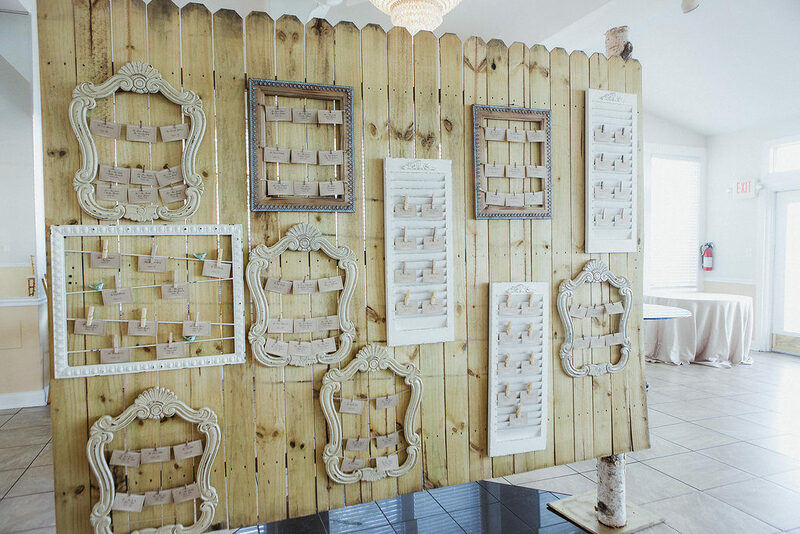 The vows symbolize components for a happily married life. 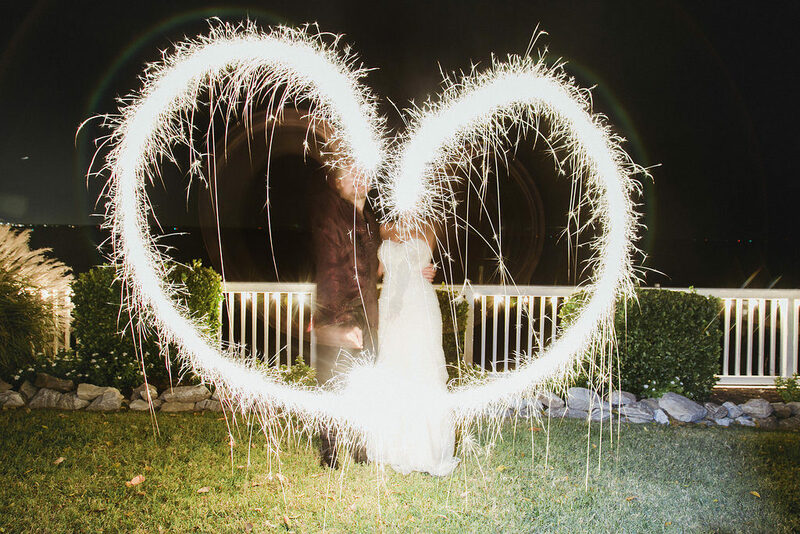 These vows validate the marriage and ceremonies are incomplete without them. The first step is taken to earn and provide a living for their household or family, and avoiding those things that might harm them. The second step is taken to build their physical, mental and spiritual powers and to lead a healthy lifestyle. The fourth step is taken to acquire knowledge, happiness and harmony by mutual love, respect, understanding and faith. The fifth step is taken to have children for whom they will be responsible and blessed with healthy, righteous and brave children. The seventh step is taken to be true to each other, loyal and remain life-long companions by this wedlock. Exchange of Rings: Many couples these day will exchange rings as you would see in any wedding ceremony. Ashirvaada: Concluding the ceremony, the guests shower the bride and groom with rice and flower petals to bless them. As the ceremony concludes, you may notice a few things. The couple may not recess down the aisle. They sometimes stay on the mandap to receive blessings from their families or to await photos with their families. Because you cannot wear shoes onto the mandap, the bride and groom take off their shoes before stepping onto the stage. The bride’s cousins or siblings may steal the groom’s shoes and he has to bribe them to get this shoes back. Vidaai: The Bride’s Farewell. The bride’s family bids farewell to their daughter as she leaves with her husband and is usually quite an emotional moment. The couple usually rides off somewhere (could be around the block) before returning to continue the rest of the wedding day. Instead of doing the vidaai immediately after the ceremony, we’ve had couples do this at the end of the reception also. Photos: most Asian cultures love to take photos – many photos. You maybe asked to participate in group photos. Food: Indian weddings usually serve Indian food either as a buffet or family style. 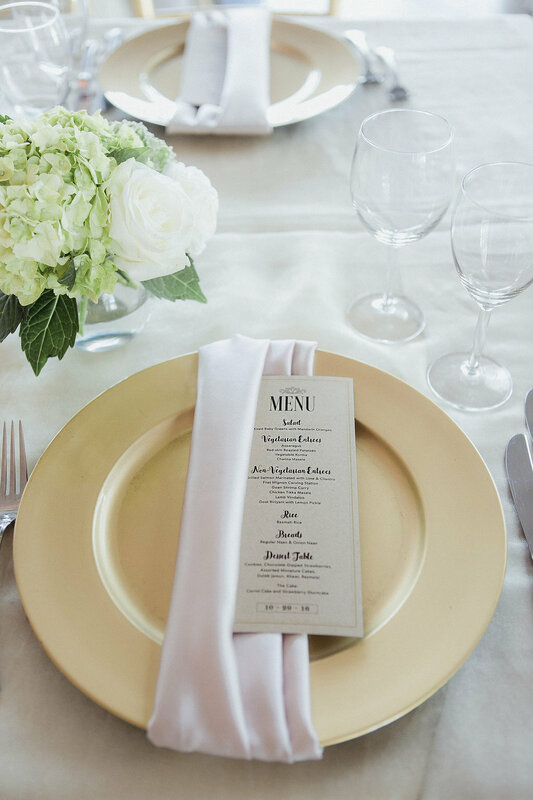 If it’s a fusion wedding, you may have dishes from other cuisines as well. 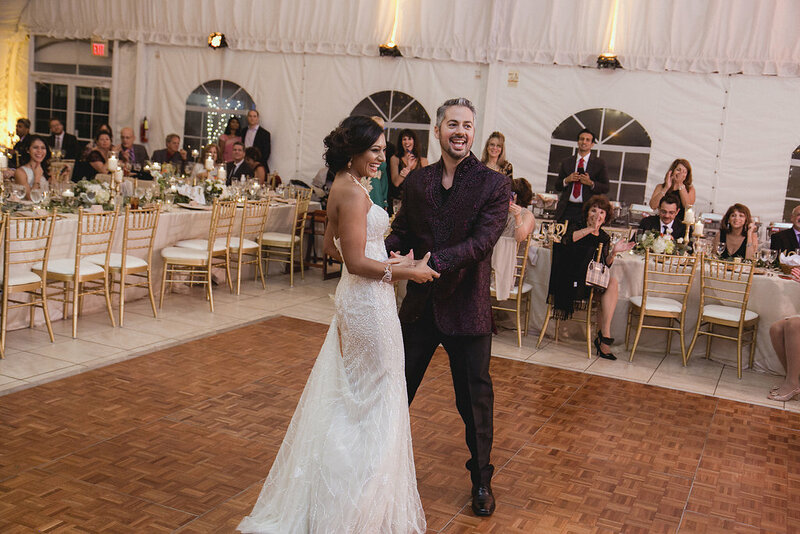 Timing Gap: there is usually about a 2 hour gap between the end of the ceremony and the start of cocktail hour to allow the bride and groom to take photos with their friends and families and to change into their evening outfits. The bride usually will have her hair and makeup restyled for the reception also. Reception Pacing: Once invited to find your table and sit down for dinner, most Indian weddings we plan love to start off the evening with introducing the couple’s families, multiple speeches, maybe a same-day edit of the video showing the festivities of the day so far, and performances by the couple’s friends and families. These activities may take up to one hour before dinner is served. Once dinner is served and eaten and dancing resumes, there are no more formalities except to dance the night away. I hope these tips are helpful to you the next time you are invited to an Indian/South Asian wedding. This was the Indian wedding that started it all in 2006. As you can read from my blog post, I am pretty sure I didn’t know what I was getting myself into. Looking back, that wedding was a gentle introduction into the South Asian wedding world, with weddings getting bigger, more complicated, and more events as the years went by. With each one we learn more about the different religions and traditions within India. I don’t recall what made me go back and look but 10 years later, we have consistently planned and coordinated Indian or Indian fusion weddings every year since. 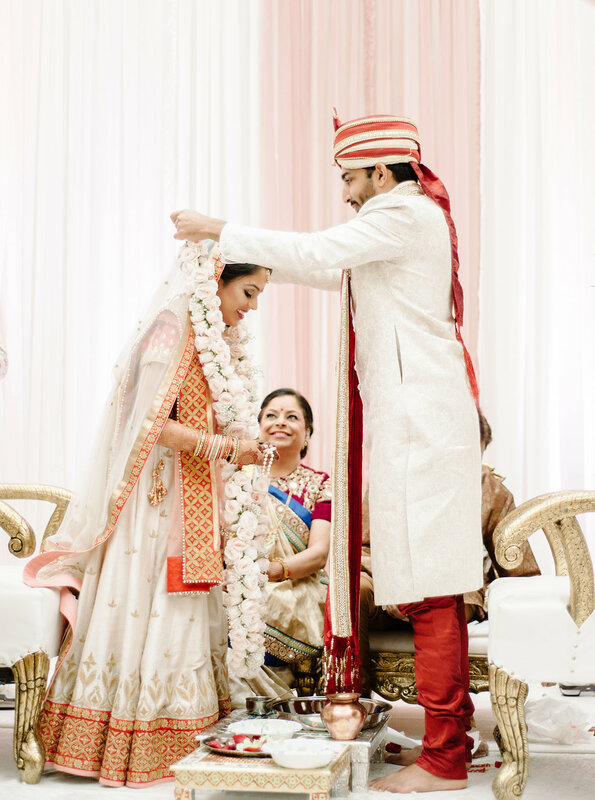 Check out our archives of Indian weddings. 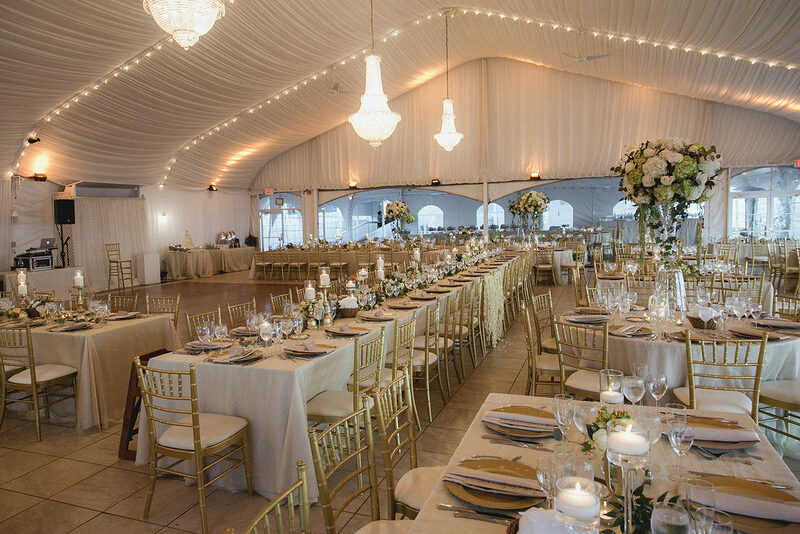 In late October in the Washington, DC area, especially by the water, the temperatures can turn quite chilly for an outdoor wedding. 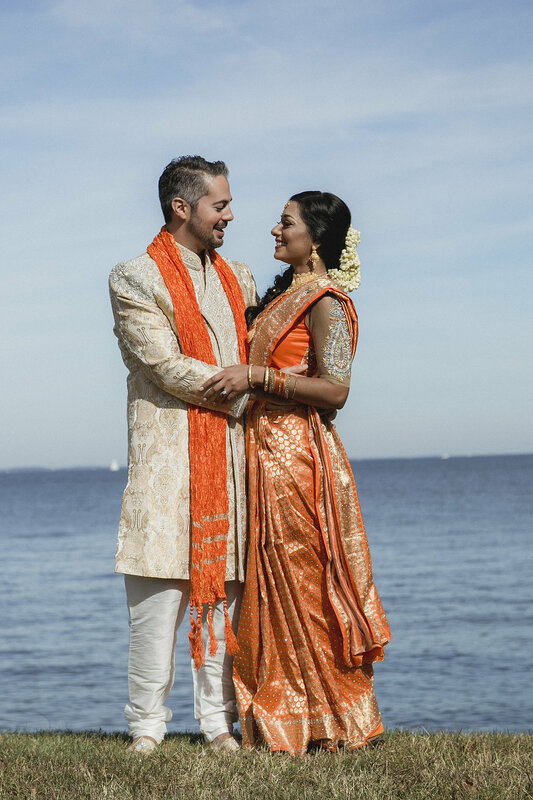 On this day, the weather was absolutely perfect for this fusion Indian wedding at Celebrations at the Bay in Pasadena, Maryland, which has uninterrupted views of the Chesapeake Bay. 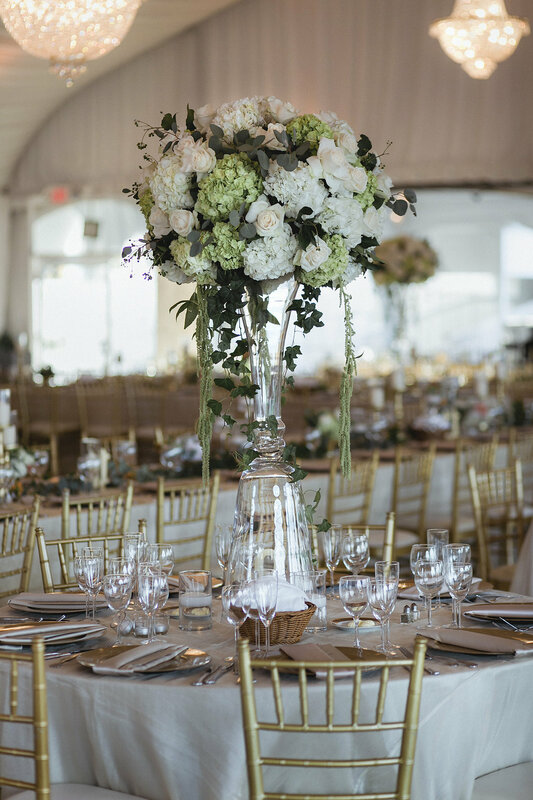 While the couple and their wedding party’s attire were vibrant in color, the decor used softer palette of colors. All photos by Echard Wheeler Photography. When the bride is a graphic designer, you know all the paper products will coordinate and look great as shown in these guest welcome bag info cards. I loved the bride’s orange and gold sari. You don’t see this color combination too often. 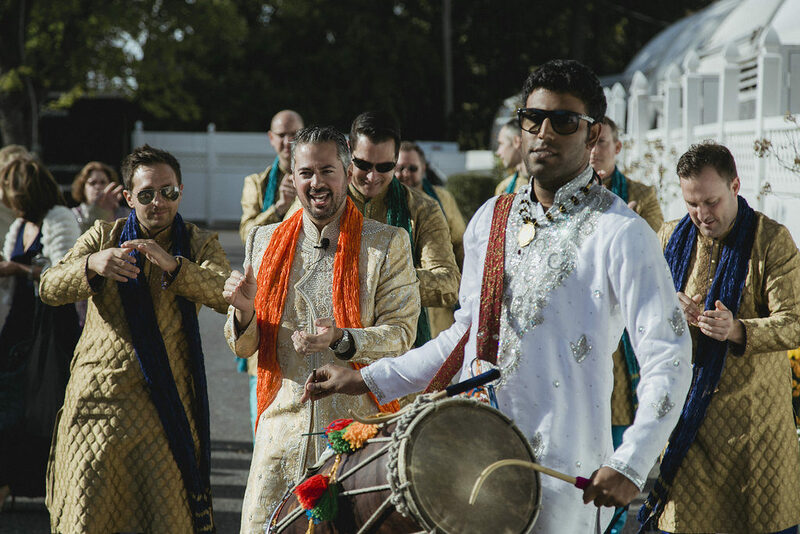 The groom wanted to have a short baraat because he thought it was one of the more fun elements of an Indian wedding. If you need a guy that can get the crowd dancing, Dholi Ram is your guy. 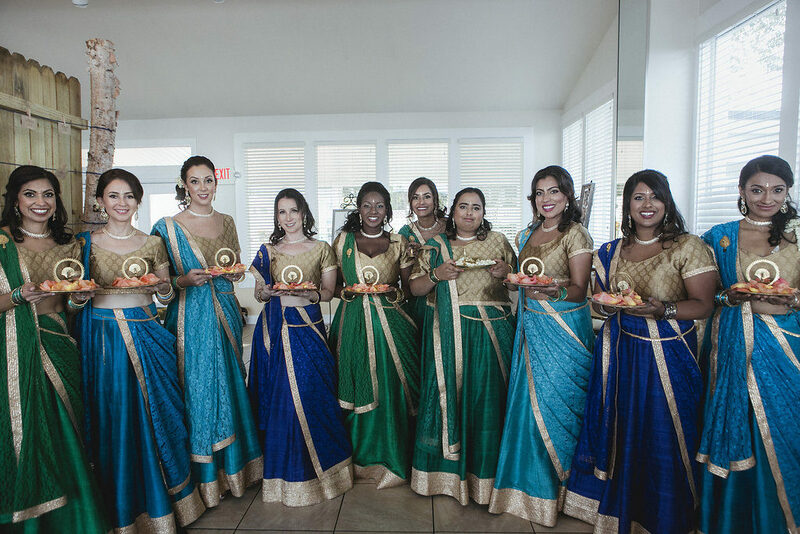 Bridesmaids ready for the processional with their thali plates. 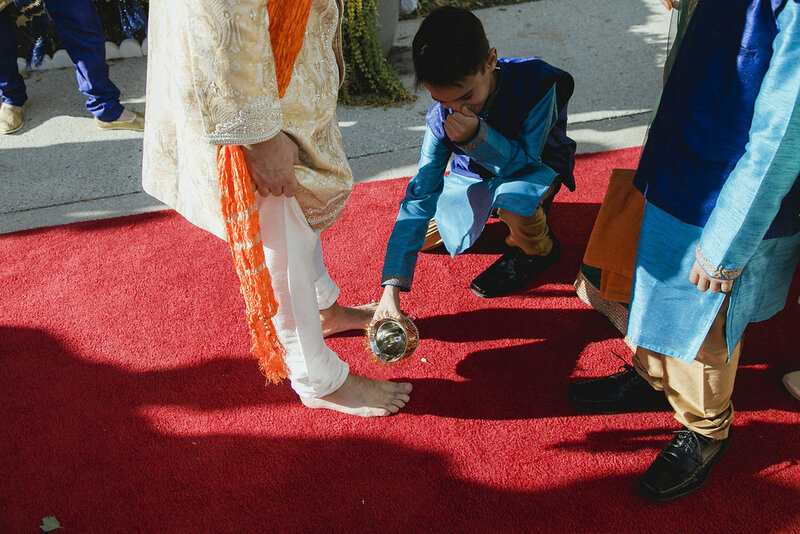 A tradition I learned with this wedding is washing of the groom’s feet as he is welcomed by the bride’s family as he enters the ceremony area. 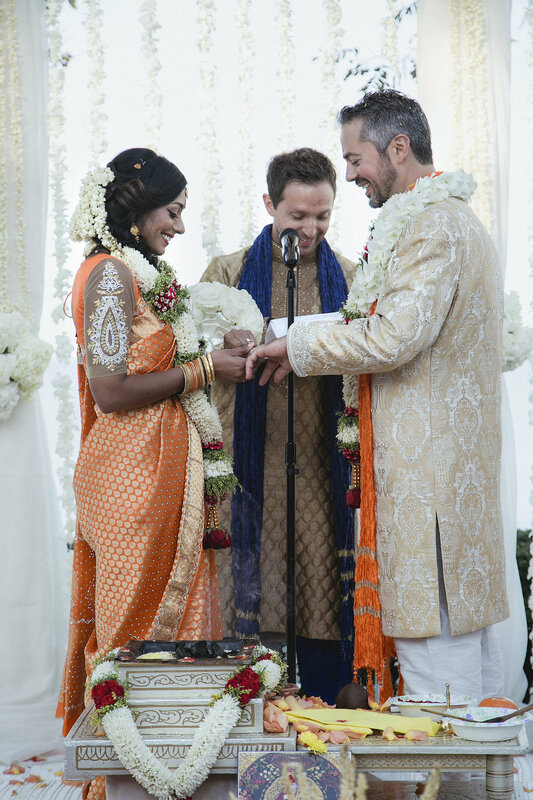 During the Hindu ceremony, the groom ties the mangalsutra necklace around the bride’s neck, the Indian version of the wedding ring. I also loved this white open mandap design by Prabha Bhambri, very airy and doesn’t block the water view. 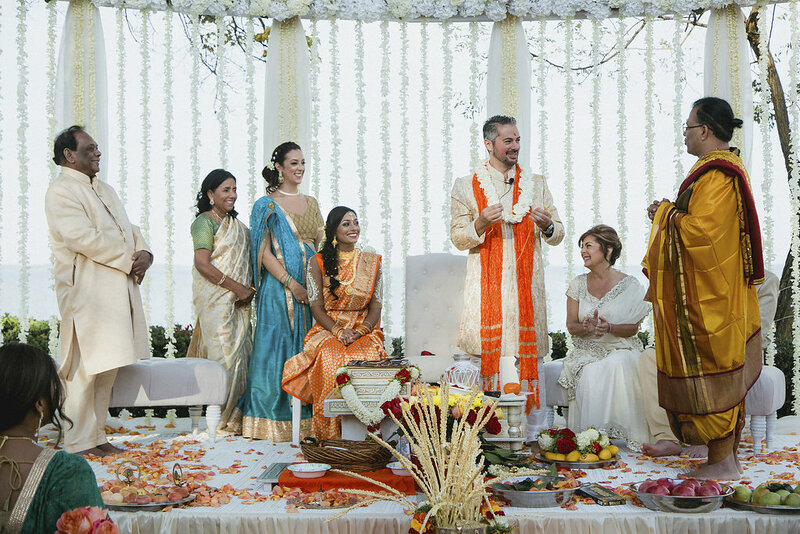 After the Hindu ceremony portion, the groom’s cousin performed a civil ceremony. 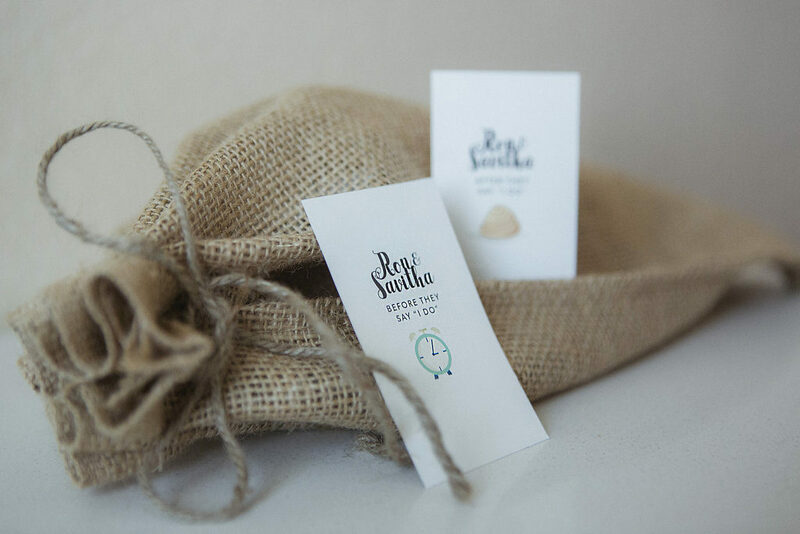 Being sailors, this “message in a bottle” guestbook was a cute idea. This was the largest kings table I’ve designed for the wedding party and their dates so far, seating nearly 30 people! 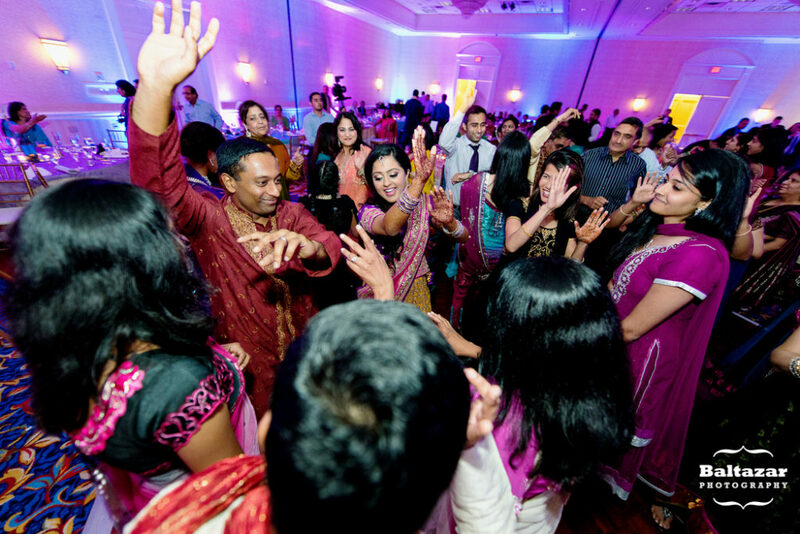 At nearly every Indian wedding, you will enjoy a lot of dancing and performances. I love this about their culture. These two are gorgeous and stylish. Look at their evening outfits! 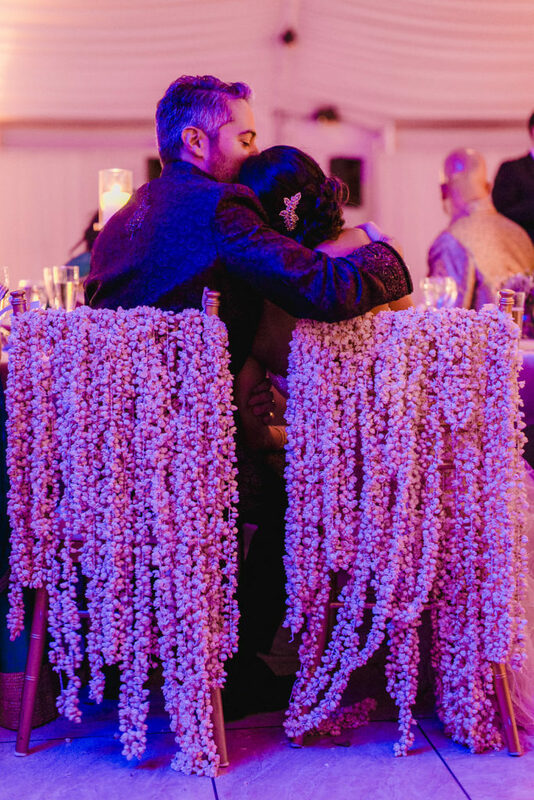 Strands of jasmines draped the back of the bride and groom’s chairs. Beautiful, and fragrant, touch! 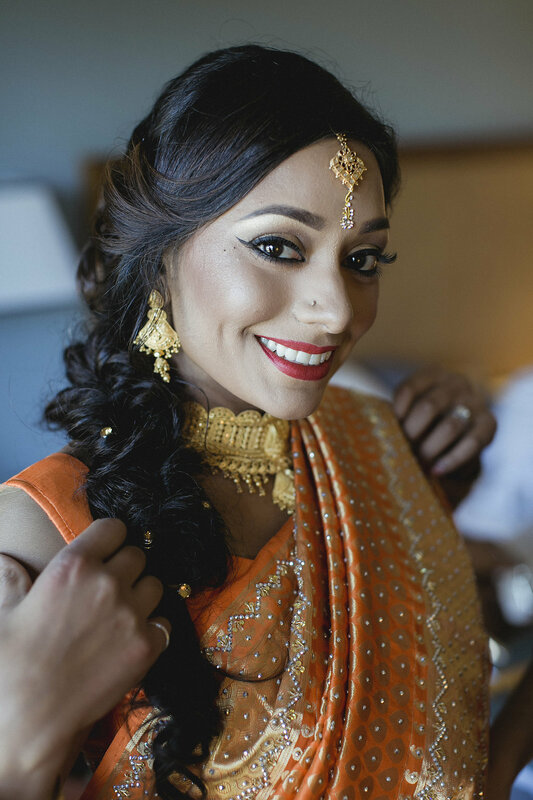 Fusion weddings are always so interesting to plan, trying to give a nod to both families’ cultures and religions while also acknowledging the couple’s individuality. 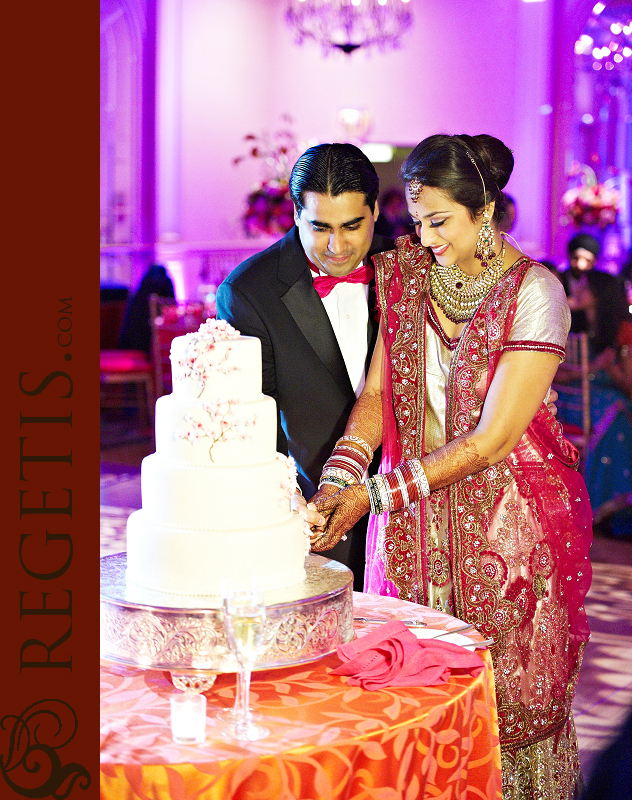 We’ve featured many Indian weddings in this blog. Check them out!